Six weeks ago today I moved to London. A little longer than six weeks today, I would say things like ‘I have a job in London’ or ‘I just signed a lease for a flat in London’ and it felt strange and unreal. Distant. Like I was talking about someone else’s real life, or making up stories for myself, like ‘one day I really will open up a cake and whiskey shop and Laks will be in charge of the till’. And then it became real. Properly, vividly, seriously-why-is-there-no-kewpie-mayonnaise-here real. And I’ve loved it. I have. Even the wonky bits. I have discovered the gluten free sections of various supermarkets – I have been to various supermarkets. I have walked in all sorts of directions from my flat, usually with one location in mind (more often than not coffee-related) but with everything else flexible. I have got so lost. So so lost. I have almost walked past Kensington Palace thinking it was just another lovely big house in London because there were no obvious signs from the direction I came – and what else is a palace but a lovely big house at the end of the day? Did I mention how lost I’ve been? And how much I’ve loved it? In the aftermath of the terror attacks that have happened since I’ve been here – one just last night not too far from where I live – I am in awe of how people here just keep on keeping on. I don’t have the right words for it but, as an outsider still looking in, there is such a a strength in this city that not many other cities necessarily have. 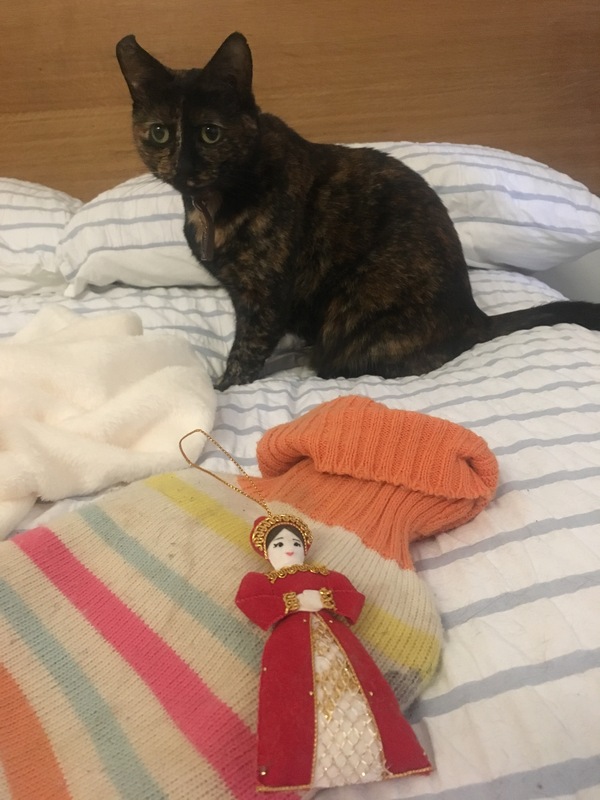 And after a year of working on Nauru, having to leave Laks behind in Australia – with beautiful foster fathers no question but being without Laks for a year – my tortoiseshell girl is with me. Sitting on the windowsill that leads to our terrace as I write this, telling me that we really should go outside. Laks makes London home. She arrived on the Wednesday after me. I learned about cats and jetlag, and just exactly how adaptable Laks is. One wobbly night and then by the next, she had sorted out her favourite places and started a territory dispute with the tom next door. It’s funny – as I am finding things to love here, to make me feel tethered when absolutely everything is new – so is Laks. And I love discovering the things she decides are precious as she navigates her new world. Her hot water bottle – obviously – has been a long time love. And so obvious a love that I brought it with me. Just as I brought her other toys, especially Monty mouse. Laks’ love for her hot water remains undiminished. But she hasn’t played with monty mouse since she arrived. 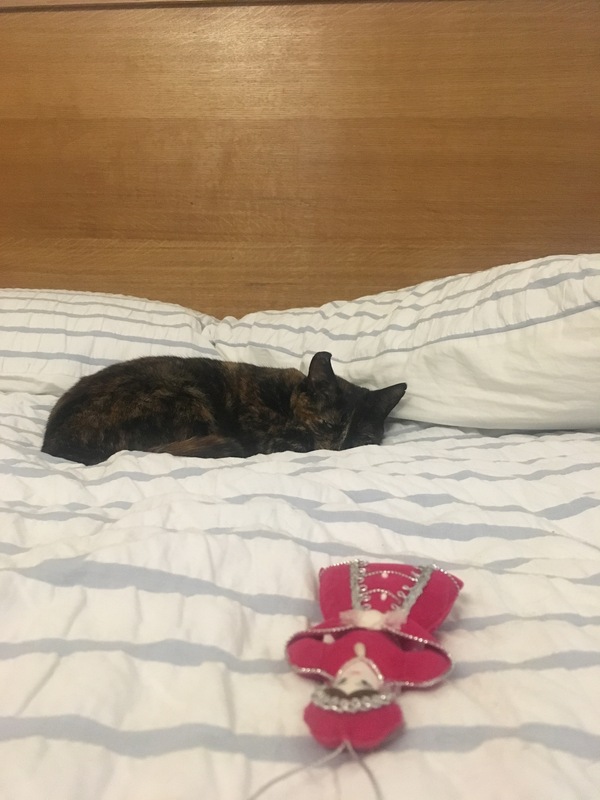 First, Laks decided she loved my little woollen cat brooch and started taking to sleep with her, along with the hot water bottle. Fearful of either cat or hot water bottle being pierced, I removed the pin of the brooch. And then all of a sudden, Laks’ love seemed to lessen. Maybe the pin, and the danger connected to it, was part of the attraction. Now, Laks has found a new love but one that seems to come with a hierarchy. A few years ago, on a visit to London, I went to Hampton Court and bought handmade dolls of King Henry VIII and his wives. Obviously. I love them to pieces – they are brilliantly kitschy and actually beautifully made. Laks has attacked Henry several times in the past and he is now missing an arm. My tiny feminist cat obviously exerting some anger at his treatment of women. In the past few weeks though, Laks has been stealing some of the dolls to curl up with against the hot water bottle. I have come home to her sound asleep with a paw protectively over Catherine of Aragon. At one point, Laks hid all three Catherines behind the radiator, which felt a little mysterious, especially as she’s never moved Anne Boleyn or Jane Seymour. She occasionally takes Henry and puts him with a little Day of the Dead bride figurine, which feels strangely apt. All I know is that I am never quite sure what I will come home to in terms of where Laks has put things and who is sleeping with who. What I love though is as I carry around my phone and journals like security blankets to keep on touch with people and to start my own routines here, so is Laks. We are both figuring out our spaces, our good lives. I just wish I could see into Laks’ head and see how she is making these decisions. It would be deeply entertaining.